Home > Extreme Couponing 101 > What Does it All Mean? 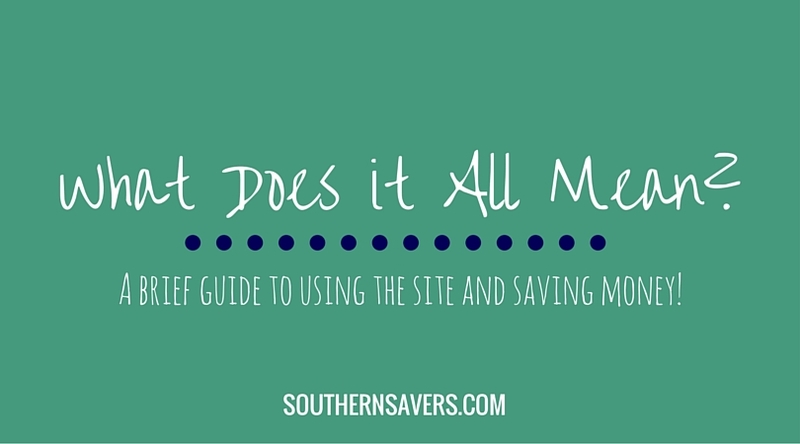 I have a wide range of posts about how to save in the store and coupons in general but realized that aren’t many places on Southern Savers that explain how to use the lists and the site. I know the lists are long and very colorful and for many newcomers it just turns into a mass of words. To find deals for a specific store you can use the buttons below the main header to go straight to a list of all recent posts. Some stores have further drop options like Publix, you can go only to the penny item post or to the advantage buy lists. The two buttons on the far right will take you to the weekly coupon previews and the “Top Deals” and “Need it Now” lists. These are to help you sort through all the stores faster if there is only one or two staple items that you need. If you need to find a post for another store or maybe from a past printable coupon list then use the drop down list to the left that says “Deals by Store” it is all the categories that I use to organize things. When you are looking at a list you are looking at the deals in the store that are considered to be at their lowest possible price. I do not list entire weekly ads because many items are not on sale or are only a fraction of the sale that they will be later. For more about the basics of saving go here. The item on sale and any details are in black. The coupons available are in red. My notes and tips for you are in green. I try to list all the coupons that are out for that item so that you can find more to use. Since we want to stock up on items we want to have a coupon for each item. You can only use one manufacturer coupon per item though so pick the coupons you have. RP 6/07 – this coupon was in the Red Plum newspaper insert on June 7th. booklet – usually found at the store also around the front entrance or on end cap displays, ask customer service if they have it too. SS 7/12– coupons for the same value are also in the Smart Source Sunday newspaper insert from July 12th and 19th. Depending on how you organize your coupons you will not need to worry about the insert dates.You will have cut up your inserts so these do not matter you will just go to your coupon organizer and see if you have them.If you do not cut your inserts then the dates are there for you. For printable links I try to get you as close to the coupon as possible.Some do require registration but many do not. For more lingo questions check out the incredibly long lingo list. Your goal is stick to the list as much a possible when in the store so the easiest thing is to highlight the entire list and copy it into a word document. Delete what you do not want to buy and then add the few things that you need that are not on sale (note “few”). I would recommend using this list as your shopping list in the store. It helps you stay on task of only buying sale items and it helps you at check out to remember the coupons you need and the price that it should be. One note on price… stores do vary by 10-20 cents on items that are on sale depending on area. You will at least know whether it rang up at the B1G1 price or if it’s way off. Go here to read the basics of saving in a grocery store. If you really need a specific item right now try using the search bar on the left side to find that item in a deal list. This is also great if you want to know what coupons are out for something not on this week’s list. While 200 comments may seem daunting, always try to skim the comments when getting your list together. There are great ideas that you guys have to share! I try to move deals to the main list, but sometimes I can’t even keep up with all comments.